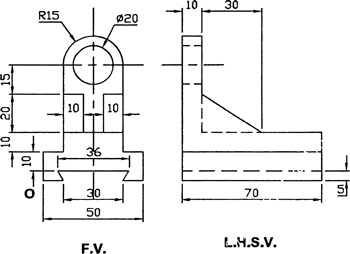 (15 marks) 3 A cone,diameter of base 60mm and height 70mm has one of the generators in the HP and the plane containing the axis and that generator makes an angle 45° with VP. Draw theprojection of cone when the apex is away from the observer. (15 marks) 4 A hexagonal pyramids of side of base 40mm and axis length of 70mm is resting on its base on HP with two edges perpendicular to VP. 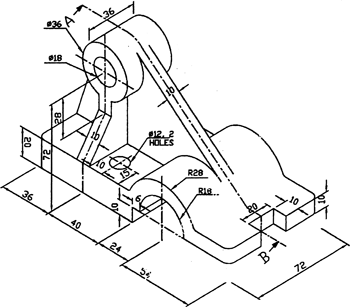 It is cut by an auxiliary inclined plane 60° to HP and passing through a point on the axis 40mm above the base. 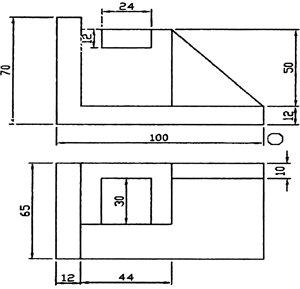 Draw the front view,sectional top view and the true shape of the section. Also draw the development of the lateral surface of the cut pyramids after removing the portion containing the apex. (15 marks) 5(a) A pentagonal prism of 40mm edge of base and 70mm length of axix is having an edge of base in the HP and the rectangular face containing that edge is inclined 30° to HP and perpendicular to VP. Draw the projection. (6 marks) 5(b) The orthographic projection of an object is given in the figure below. 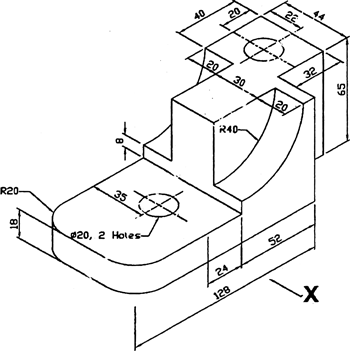 Draw the isometric view. (9 marks) 6(a) The top view and the front view of line AB are 70mm and 80mm respectively. Its end A is 15mm above HP and 20mm in front VP. The end Bis third quadrant.Draw the projection if the line is 100mm long. Also find its inclination with the principle planes. (8 marks) 6(b) Draw the isometric view of the given views.